Delta, Powering Green Mobility installed 15 kW DC Fast-Charger EV Charging Station at Maharashtra Mantralaya Mumbai, India: Delta Electronics India Pvt. Ltd, a Power and Energy management company, launched Mumbai’s first DC Fast-Charger station at Maharashtra Mantralaya. 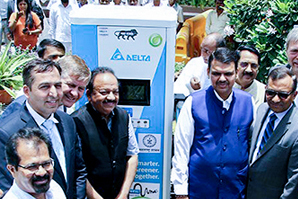 The EV Charging Station was launched by Dr. Harsh Vardhan Union Minister Government of India and Mr. Devendra Fadnavis, Chief Minister of Maharashtra.